My name is Dave Black, and I have a personal story I need to share with you before continuing this post. Two years ago, my son, Army Staff Sergeant Darby Charles Black, took his own life. He was a combat veteran suffering from PTSD, and he is too far from alone. Suicide is the leading cause of death in veterans, and in some recent years, has taken more lives than combat among active duty personnel. I can’t help but wonder if Darby and others could have found a more peaceful and alternate path in life, if they had been afforded some special time to retreat from everything else the world imposed upon them. Our soldiers keep us ultimately safe, and I worry that we are failing them in ways the majority of our country does not fully understand due to a lack of education and stigma surrounding PTSD and mental illness. As I have come to know Kulaniapia, I have come to appreciate a healing opportunity that could be provided to many in need, our combat veterans especially included. To this day, I wonder, if my son had access to a similar retreat, if he might be here with us today. I cannot wonder this any longer, but hope to offer other veterans struggling with PTSD, the opportunity to find peace and serenity, and connect with those who love them most, and new friends who appreciate the challenges they face. A few weeks ago, Kulaniapia’s partners approached me about developing a waterfall rappelling experience. After several visits, I can confidently say that this property offers one of the best sites in the world for this activity. I am thrilled to be involved, and we are hoping to launch for Inn guests in early April. After negotiating my compensation, I asked Kulaniapia to consider an alternative. Instead of paying me anywhere near as much, I have asked Kulaniapia to make an ongoing commitment to our combat veterans, specifically those suffering from PTSD, and provide retreats for those most in need. Kulaniapia has started a new company, Kulaniapia Adventures that has committed to providing 3% of that company’s net profits in the first year to providing accommodation at the Inn to combat veterans, burdened by life threatening PTSD. This new company will operate the waterfall rappelling experience, where I will serve as the Master Guide, as well as the Safety and Community Manager. In my capacity as Safety Manager, I will ensure the operation exceeds best practices for guide training and guest safety. In my capacity as Community Manager, I will work with the outdoor adventure community and aligned nonprofits that share our goal of supporting our veterans in need of a peaceful retreat. 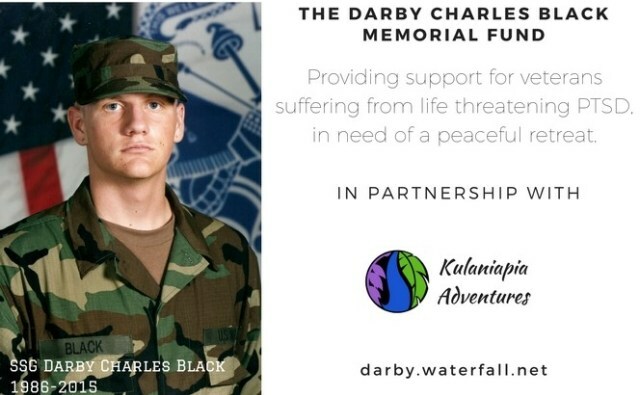 In addition, myself and the larger Kulaniapia partnership have committed to provide $15,000 to establish the Darby Charles Black Memorial Fund, which will help offset travel expenses for combat veterans participating in such retreats. You may learn more and contribute at darby.waterfall.net.